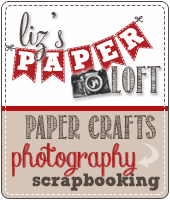 Liz's Paper Loft: MCT 27th Edition Blog Hop ~ You're Invited! 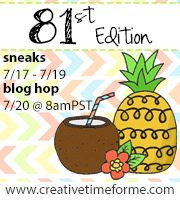 MCT 27th Edition Blog Hop ~ You're Invited! 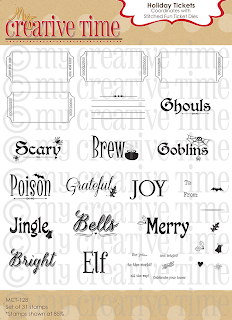 Welcome to My Creative Time's October Release Blog Hop, I can hardly believe it's finally here! This release has been so fun, I really hope you've enjoyed the week as much as I have! You should have arrived here from Miss Leanne. If not then be sure to head over to Miss Emma's blog Miss Emma for the start. I know you won't want to miss a thing! 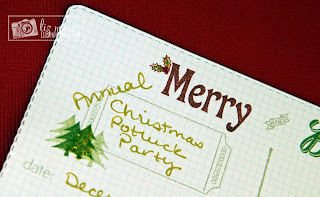 My project is an invitation for our annual Christmas Potluck Party. Since I decorated the "stamp" area, I would not mail these without an envelope. 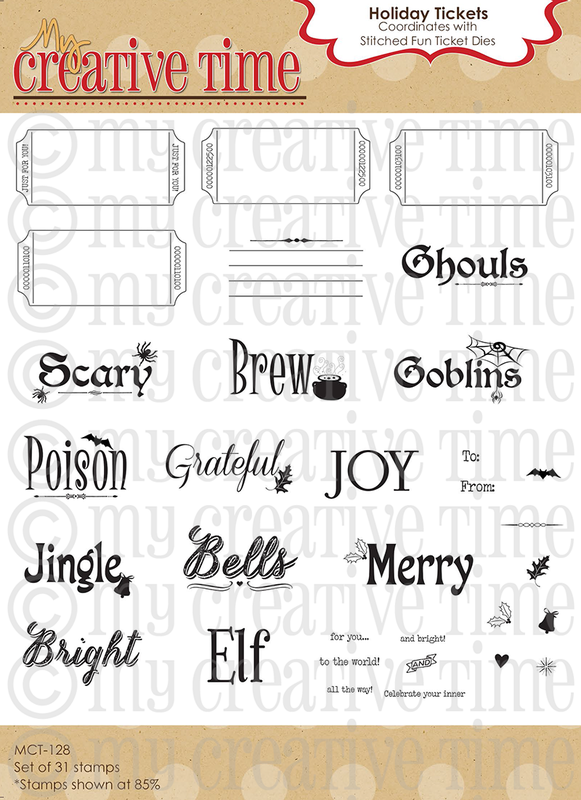 I used "merry, and, bright, and the ticket" from the Holiday Ticket stamp set! 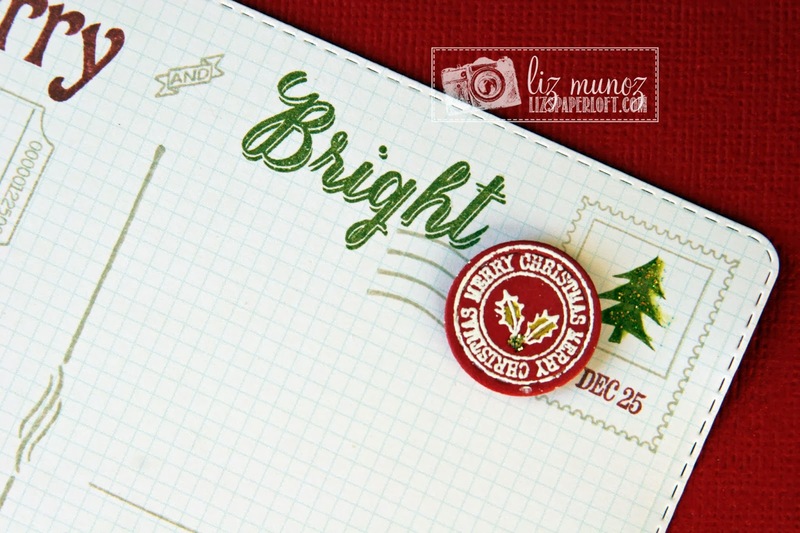 If you have a large stamp block you could put all the stamps using the same color on the block and stamp one time. Doing it this way would allow you to get a bunch done fairly quick! 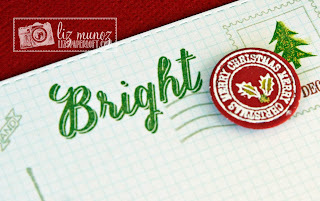 I used the Build a Banner stitched circle die then heat embossed the white powder. Once dry, I used a gold pen and gold stickles on the little holly leaves. A bit of green and red stickles adds sooo much in person. Oh, I almost forgot that added small amount of diamond stickles to the trees. :) I'm having a thing for stickles lately...oh who am I kidding, I always want sparkle on my projects! 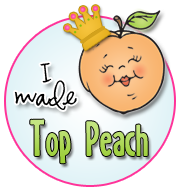 Winner #2 ~ will be our "Guest Designer" for our Next Release! 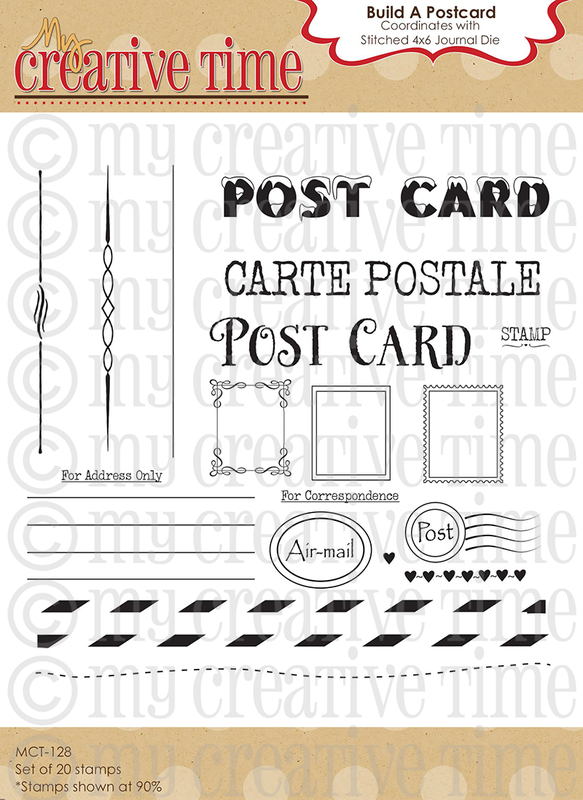 Beautiful post card...this is a fab new set! Awesome! I love this idea-a postcard invite. Love all the elements you added to decorate it up. Beautiful invitation-great use of the new release products! Liz you have shown some amazing projects all week and I've loved everything from this new release! 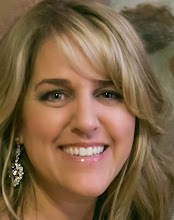 Your invitation is awesome and I love how versatile all these products are! Have a great weekend! 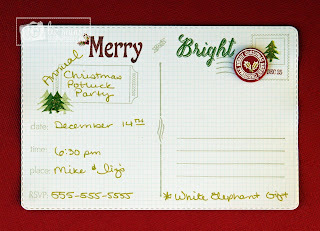 Very cute and festive invite! 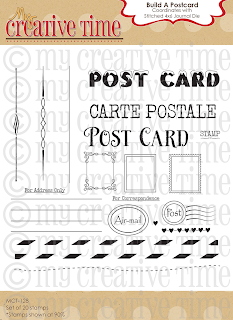 Love the whole design and vintage feel of a postcard! Great job Liz! That's a really great idea for an invitation. So pretty. Beautiful invitations like these will certainly be welcomed and accepted! Gorgeous! This is a beautiful invitation! Super cute party invitation! 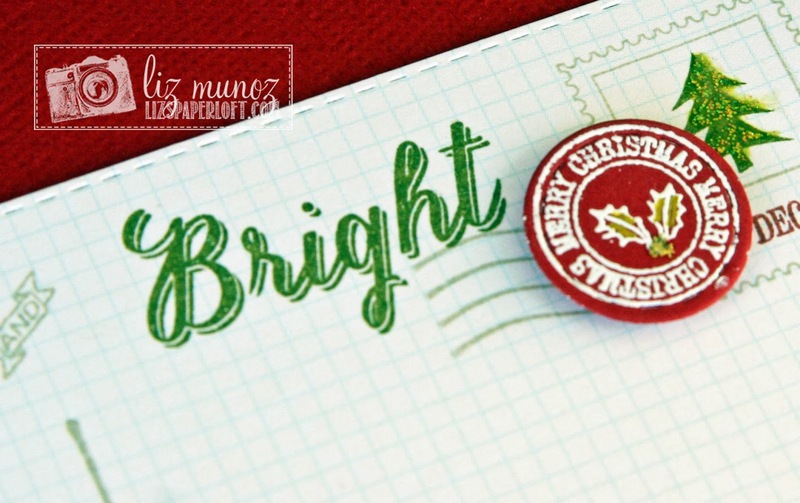 I love the cute stamps and the fun little sparkle you added! 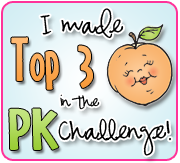 Way to ROCK the projects this week! So much inspiration! Beautiful invites Liz! Loved all your projects this week. I really really like this Post Card Die, these new stamps sets are perfect for them. Great Job Liz! OMG Liz what an awesome postcard you did wow you are just so creative that you never cease to amaze me and leave me shaking my head in awe of your talents. I can't wait to get my order so I can give this a go. I love how you used all of Miss Emma's goodies. Just WOW!!! 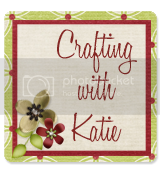 Awesome Liz, I just LOVE all your projects! They are fantastic! Thanks for a fabulous week of inspiration and Tons of fun! I have SOOOOO many ideas! I HAVE to have this set! The dies and the stamps. Thanks a lot, lol. Beautiful card and great idea! Love it! TFS! This is beautiful and such a great idea. TFS! This is too cute! I love it:) Thanks for sharing! WOW Great job Liz! Love this idea! And wow I love your blog! big hugs to you! Liz ~ Oh this is so darn GORGOEUS! I LOVE the idea that you made this into an invite!! Then all the stamps you used!! The ticket die one was so CLEVER to use for the title!!! Then of course your handwriting! I can't WAIT until I get my invite to this party! LOL! AWESOME creation like always ~ Have a GREAT weekend! I like sparkle too and would think your card looks awesome in person. Great idea to use for invitations. Beautiful Job. What a great idea to use the Post Card stamp/ 3x4 die as an invitation. Beautiful card Liz! Such a fun way to send an invite!!! Thanks for sharing and have a GREAT weekend!!!! Cute, cute, cute! How could anyone not come? 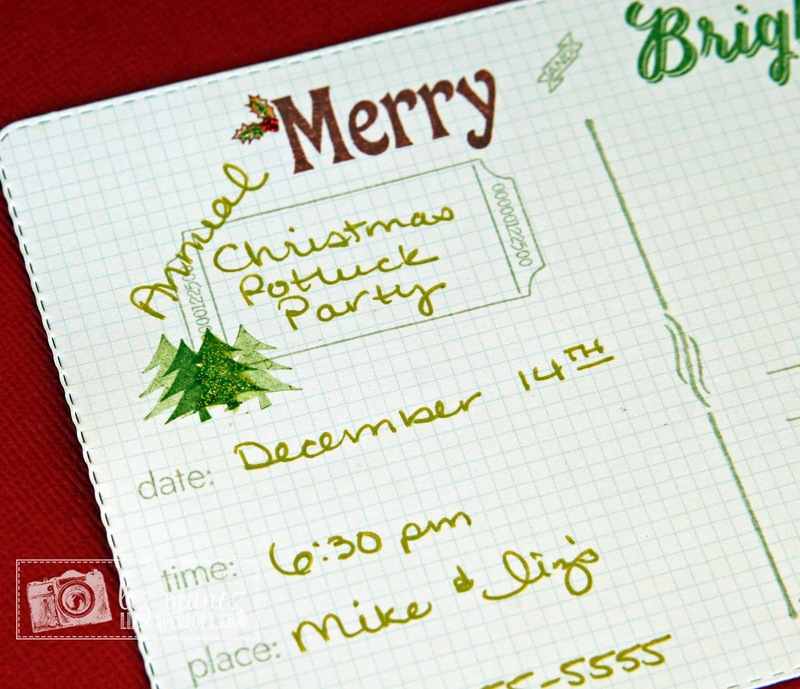 Awesome idea for your invite! This is adorable! I'll see you on the 14th! Good thing I have your address, since you forgot to put it on the invite! Love that invite! So creative! Great idea for an invitation!! Love the way you used the Post Card set. I like the party idea. Sounds like a fun get together. The post card turned out awesome. Love the stickles. These postcard invitations are darling! I love all the little bits of detail on everything. I LOVE your invites. What a wonderful idea. TFS. What a GREAT idea to make invites out of this!!!! I LOVE IT!!!!!!! THANK YOU!!! fabulous idea Liz! Love it!! This is amazing! Every blog I visit, I want something else. Sigh. MCT Designer Challenge ~ Happy Fall! Scrapping The Little Things ~ Showered with Love! Halloween Hustle Day 5 ~ so cute! Halloween Hustle Day 3 ~ just treats! Halloween Hustle Day 2 ~ hey there pumpkin! Halloween Hustle Day 1 ~ goblins and ghouls! MCT Sneak Peek Day #4 ~ Need a Lift? 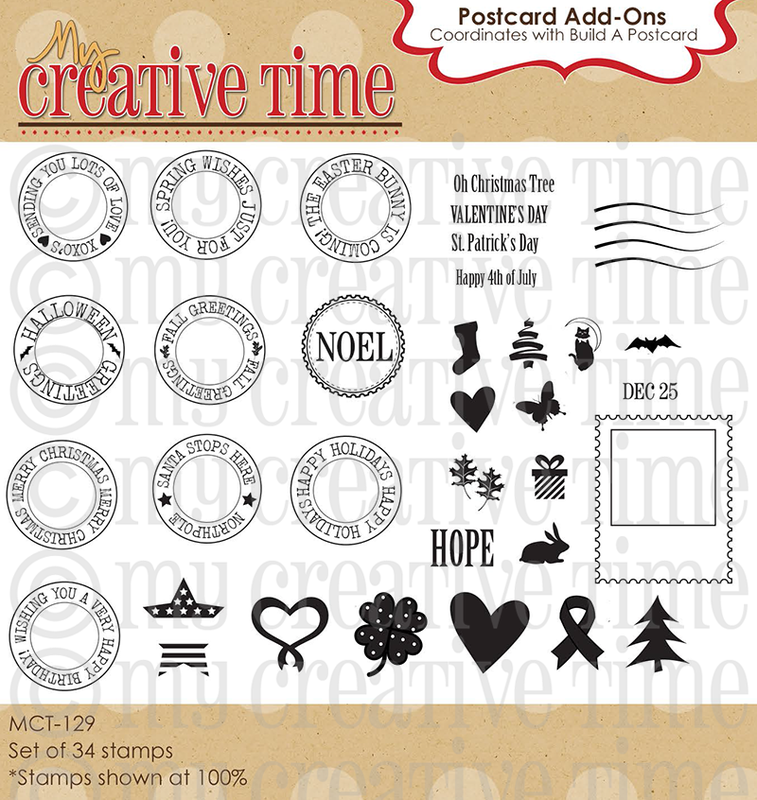 MCT Sneak Peek Day #3 ~ Cookie Time! 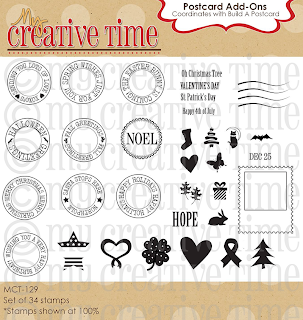 MCT Sneak Peek Day #2 ~ Celebrate the New Year! MCT Sneak Peek Day #1 ~ Thank You! MCT Designer Challenge ~ Dancing Leaves!